It's hard to beat the value for money that the Essential Phone offers. It has a nearly bezel-less front and a notch, a ceramic back, a 5.7" 1440p LCD, a Snapdragon 835, 4GB of RAM, 128GB of storage, dual cameras, and a 3,040mAh battery. Our own Ryne reports that the T-Mobile signal issues have been slightly alleviated with the latest P beta, which is good to hear. As for the free items, there are three: the Earphones HD, the 360 Camera, and a carrying case for the 360 Camera. The Earphones HD (which we've reviewed) and the 360 Camera have both seen significant price drops since they were launched, though their current values are about $107 right now. 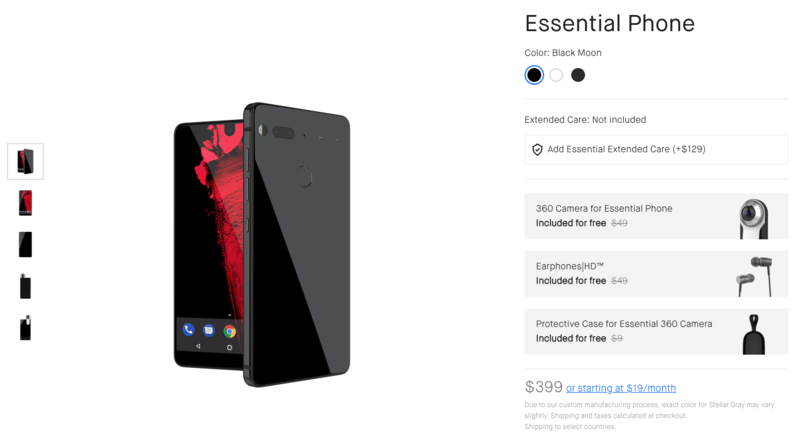 Essential says that this deal will be "available for a limited time." We're not sure what exactly that means, but I wouldn't wait too long if I were interested. Hit the source link below to pick one up.